Now in our showroom and available! But the LX700 series takes it a step further, using Headphone Acoustic Projection technology to optimize the sound sent to the headphones. As you play, you’re enveloped in rich, warm sound that seems to emanate from the piano itself. You’ll enjoy all the benefits of the PureAcoustic Ambience feature on the headphones, too – just close your eyes and you could be playing a midnight concerto in a concert hall, from the comfort of your own home. With 40mm drivers, neodymium magnets and CCAW (copper-clad aluminum wire) voice coils, these professional headphones offer the clarity and sonic accuracy needed for mixing and silent practice. 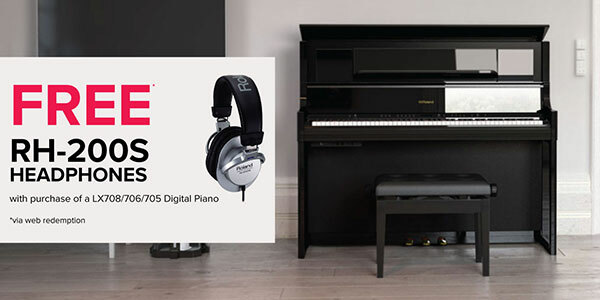 Purchase a Roland LX708, LX706 or LX705 Digital Piano from an Authorised Australian Roland dealer, and receive a pair of Roland RH-200S headphones! Purchase must be made between 11th of March 2019 and 20th of April 2019. Request must be submitted by 5th of May, 2019.